HOULTON—Whether you’re looking for information on health, home safety, or heating assistance, you just might find what you need at the Cross Resource Café at St. Mary of the Visitation Parish in Houlton. “This puts a lot of resources in one place, whether we’re looking at medical, educational, legal, housing, ACAP (Aroostook County Action Program), whatever,” said Lynette Dobbs, the café coordinator. The café operates 9-11 a.m. Tuesday and Thursday mornings, the same hours as Mildred’s Food Pantry and a nutrition education program, also located in the parish hall. The café provides a place for patrons picking up groceries, or anyone else who wants to stop in, to enjoy a cup of coffee, engage in a little conversation and learn about services available in southern Aroostook County. Spread through the café are dozens of brochures and pamphlets on assisted living, bus schedules, career advancement, disability services, educational programs, finances and more. “I find the elderly are looking for diabetes information, rides. They’re not so interested in heat, food, whatever. They’re more interested in medical. And the younger ones who come in are more interested in securing their home,” said Judy Porter of Houlton, one of the volunteers. “Somebody can come in and say, o.k., I’m looking for such and such, and they’ll just browse. Sometimes, people don’t even know what they’re looking for, and they’ll be browsing, and they’ll go, ‘Oh wow. Look at this. I could use that,’” said Dobbs. In addition to connecting people with resources, the volunteers said there is another important aspect to the café: making those who visit the food pantry feel more at ease and welcome. “The other benefit is being seen as a person and just being accepted and loved and having a sense of belonging,” said Dobbs. “Basically, that is what I do – try to get a conversation going with the men. Sometimes, we talk for quite a while,” said Ray Gladu, from Sherman, another volunteer. “We all need someone to share our story with. It’s part of human nature I think,” added Dobbs. 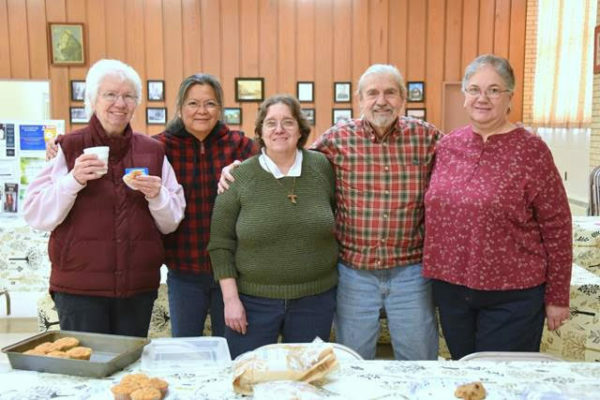 The café opened in October 2018, thanks in part to a $1,000 grant from the Catholic Campaign for Human Development (CCHD), which was used for training. This year, another CCHD grant, for $970, will allow the program to expand. The parish is seeking to educate and involve more parishioners. It wants the café to have a semi-permanent setup, so that volunteers don’t have to continually arrange and take down displays, and it would like to create an office, so that patrons will have privacy if they wish to discuss personal issues or contact an agency. The Catholic Campaign for Human Development is the United States Bishops’ anti-poverty initiative. CCHD grants are awarded to programs aimed at helping people make sustainable change. The program is supported each year through a collection taken up in parishes across the country. While seventy-five percent of the money raised goes to the United States Conference of Catholic Bishops, 25% remains within a diocese to support local programs, such as the one at St. Mary of the Visitation Parish. — St. Brendan the Navigator Parish in Camden received a $3,000 grant, which will assist in funding a 12-hour a week parish social ministry position so that the parish can better assist community members in need. — The five Portland Peninsula & Island Parishes (Cathedral of the Immaculate Conception Parish, Portland; Sacred Heart/St. Dominic Parish, Portland; St. Christopher Parish, Peaks Island; St. Louis Parish, Portland; St. Peter Parish, Portland) received a $2,500 grant to support the Catholic Community Response to Addiction and Mental Illness, a new, faith-based ministry aimed at connecting those suffering with addiction and mental illness to resources and at educating community members about the issues. The money will be used to train peer recovery coaches, to hold a public health fair focused on addiction and mental illness, and to provide, in its churches, literature on local resources. The parishes also plan to hold a prayer service and pray a monthly rosary for health and healing. The Portland Peninsula & Island Parishes believe they are well positioned to play a role in combating the opioid crisis because many of their churches are located in some of the most populated and vulnerable neighborhoods in the state, and because of the services already provided by the St. Vincent de Paul Soup Kitchen, located at the Cathedral of the Immaculate Conception’s Guild Hall, and the Sacred Heart/St. Dominic Food Pantry. — St. Rose of Lima Parish in Jay and St. Joseph Parish in Farmington will use a $2,500 grant to help fund a part-time parish social ministry coordinator position. The coordinator supports the many parishioners who volunteer for social outreach ministries and also seeks to help people in need by building relationships with them. The coordinator will also work to develop new programs such as cooking classes and financial wellness workshops. — Holy Savior Parish in Rumford will use a $2,000 grant to serve the elderly and homebound. The money will be used to hold informational events at St. Athanasius & St. John Church on topics such as health, personal finance, and home safety. The events will also be a way to build community partnerships and will provide an opportunity for socialization since there is no senior center in the area. –The Parish of the Precious Blood in Caribou received a $750 grant for its parish social ministry program, H.O.P.E. (Helping Other People Eagerly). The parish is seeking to better integrate H.O.P.E.’s mission with the work being done by the city’s food pantry and Bread of Life Soup Kitchen. That will include helping patrons learn how to prepare healthy meals and offering financial wellness workshops. The mission of Parish Social Ministry is to provide leadership, guidance, Catholic social teaching education and training to empower parishioners to compassionately serve people of all faiths living in their communities. For more information, contact Michael Smith, director of mission for Catholic Charities Maine, at (207) 523-2772 or msmith@ccmaine.org.